Town boss Neil Aspin says his side must tighten up at the back in time for The Shaymen’s first home game of the season against Chester on Tuesday night (7.45pm kick-off). Halifax were beaten 3-1 at Boreham Wood on Saturday after defensive lapses for each of the hosts’ three goals. Jordan Burrow scored on his Town debut to ensure Halifax went in level at half-time, while Jake Hibbs saw a free-kick hit the post just after the interval. Chester go into the game on the back of a 1-0 win over Braintree thanks to a debut goal by Johnny Hunt. 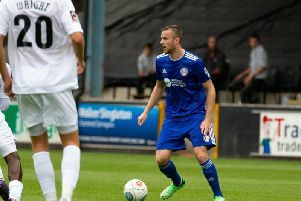 He is one of seven new faces this summer at Chester, along with the likes of former Bradford striker Ross Hannah and ex-Alfreton midfielder Tom Shaw. Of the 11 players to leave the club in the close season were Town duo Matty Brown and Kingsley James, who both made their debut at Boreham Wood. Aspin has been impressed by Steve Burr’s side over the last 12 months and believes they will come to The Shay in confident mood after their opening-day victory. “We always have good games against Chester,” he said. “They’ve strengthened over the last year and they’ve probably got stronger whereas we’ve not done as well when we beat Chester there. “They’ll fancy their chances, especially with them winning on Saturday. Josh Macdonald picked up an ankle knock on Saturday so may be subject to a late fitness check before the game. Brown and Tom Peers scored as Chester won 2-0 at The Shay last season, which exacted a measure of revenge for the visitors after Town had beaten them 3-0 on their own patch earlier in the campaign.